I know I’m just as slow as a turtle! I’ve had this book since fall and I haven’t gotten around to reading it before now even though it has been showing on my IG feed for such an amount of time. I’ve heard great things about it and I wasn’t disappointed. When a known billionaire by the name of Russell Picket mysteriously disappears Aza and her friend Daisy starts to investigate the case due to the great reward of 100 000 dollars. Aza never intended to pursue it the way they do, but she gets quite involved and it leads her to an old friend who also happens to be the billionaire’s son. Aza wants to be good, but her thoughts don’t leave her be. Her thoughts influence her constantly and make it hard for her to be the person she wants to be for her mother, Daisy, at school and in life in general. She just can’t get away from her thought spiral. I’m always curious and somewhat sceptical when I open a book written by Green. I’ve read Papertowns, Looking for Alaska and The Fault In Our Stars. I wasn’t a fan of the first two because I did not understand them or the storyline and found them hard to read. On the other hand, I loved The Fault In Our Stars and I also loved Turtles All the Way Down. This one appealed to me due to one of the main themes, mental illness, which is a topic that interests me and I always look for ways to learn more about it. In the beginning, I think I read too much into the book and I felt like I was missing something about the whole story because I thought that it might resemble Papertowns and Looking for Alaska. This was the feeling I had all along while reading Papertowns and Looking for Alaska. At some point in this book, I realized that I read too much into it and just read if you know what I mean? You never know with Green though, it can be either or and I was hoping this was a book with a direct and clear line with some messages hidden between the lines. As it should be since it’s John Green after all. One of the aspects I like about Green’s writing is that you never know what you’re going to get when you open a book he has written. Sometimes you understand nearly everything and sometimes almost nothing, or I don’t at least. I hope this book is turned into a movie at some point because it would be quite interesting to see how they would put this story into a screenplay. This book has become known for many reasons, but especially for the way it talks about mental illness. Aza is suffering from Obsessive Compulsive Disorder or OCD as many people know it. This is a disorder a lot of people joke about. How many times haven’t you heard someone say ‘My OCD kicks in when I clean the kitchen’ or you see pictures online where something is out of order and it says ‘Tag someone to ruin their day’. I’m among these people myself because, after reading the book, I don’t think we really understand how this disorder affects you or how devastating it can be to your life. I know I have a completely new perspective on this disorder after reading the book and I’m a psychology student. Green explains this disorder in such a splendid way and through the book, you are allowed into the world of Aza’s head where most things spin around a band-aid, C.diff (an infection) and bacterias. It puts things into perspective and suddenly OCD isn’t something to joke about. While reading it you understand that it isn’t funny to constantly worry about something and you can’t control your thoughts about it. It takes you over and never lets you rest. The spiral is never ending and deep. This is why I think this book is quite important and it will stick around with me for a while because I learned so much from reading it. 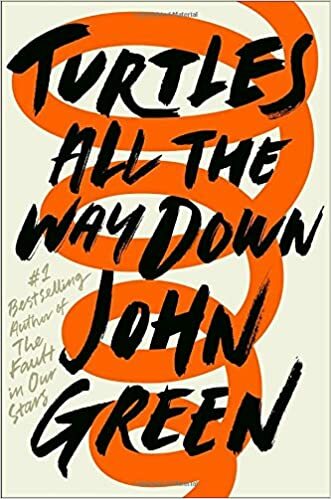 What I find most impressive in this book is how Green show us Aza’s side of the illness, but he also shows us how it affects the ones around her. The narrative is from Aza’s side, but we get a glimpse of how it is to be Daisy in all of this. I feel sympathy for Daisy because it isn’t easy when your friend is dealing with a mental illness that you can never fully understand, but you want to and you want to help, but you don’t know how. It sounds kind of bad to say that one can sympathize with Daisy when Aza obviously is the one suffering, but Daisy is also a part of the picture. It’s two sides of the same case and it is a difficult case for both girls. I’m glad the story also features some of Daisy’s feelings around Aza’s situation because a lot of people in real life are in the exact same situation and it’s a difficult one. As you can see the book has received 6/6 stars from me and hence I really recommend that you give it a read. This book will stay with you after you turn the last page! I have this one in my library but haven’t read it yet. I like hearing he does a great job writing about mental illness and I look forward to reading it even more now. Great review!